James Hewson was a dominant two-sport athlete in Western New York in the mid-20th Century. With the family nickname of “Chick”, he graduated from Riverside High School and began rowing in 1937. He became a national champion rower at Buffalo’s West Side Rowing Club and an Olympic athlete in the sport of race walking. 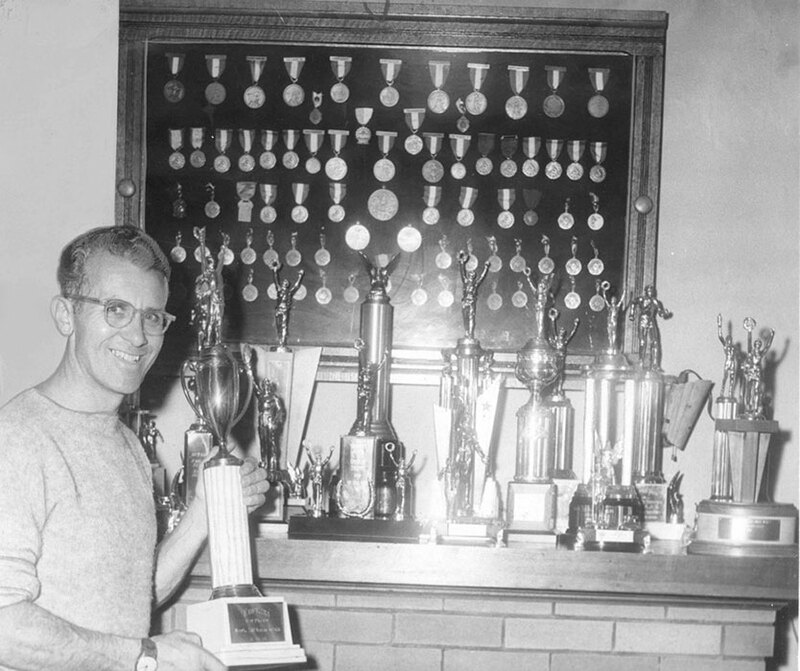 Hewson rowed in West Side boats that won 26 USA national titles. He won 49 gold medals over three decades at the prestigious Royal Canadian Henley Regatta in St. Catharine’s, Ontario, when winning one gold medal at the Henley was an achievement. He was a member of the West Side foursome that won a silver medal in the 1955 Pan American games. Hewson rowed in West Side Rowing Club boats that were finalists in the Olympic trials for the 1948 and 1952 games. When his boat just missed again for the 1956 Olympics in Melbourne he switched to the difficult sport of race walking, making the 1956 USA Olympic team in both the 20 km walk and the 50 km walk at age 39. Hewson gave his 50 km spot on the Olympic team to the 4th place finisher and concentrated on the 20 km walk. He competed in the 20 km race at the Melbourne Olympics, finishing 17th, even though he sprained his ankle during training. In addition to participating at the Olympics, he was a member of the men’s AAU All-American Track and Field teams that competed against the Eastern European and Russian teams. Hewson received a certificate from the State of New York for his life-time athletic achievements and for serving his country during World War II, making five invasion assaults as a paratrooper. At age 40, he was nominated for the Sullivan Award, given by the AAU to the nation’s best amateur athlete. Chick Hewson was a life-long physical fitness advocate who continued to compete against and beat college rowers half his age. With the nicknames of “Chick”, “Father Time” or “Nails”, Hewson was considered by many to be one of the most versatile world-class athletes in Western New York history.